Andrew Bajorek submitted this photo and caption. This photo is of my groom's cake that was displayed at my wedding reception in July of 2008. My wife, Sarah Zehner (Bajorek), was a devoted Cavalier girlfriend during my years in the corps in 2004 and 2005. So we had to include the Green Machine at our wedding! The cake is, of course, the likeness of my "aussie" that I wore while I marched with the Cavaliers. The flavor of the cake was pumpkin spice with a cream cheese frosting. It was so delicious and, as you can see, very authentic. 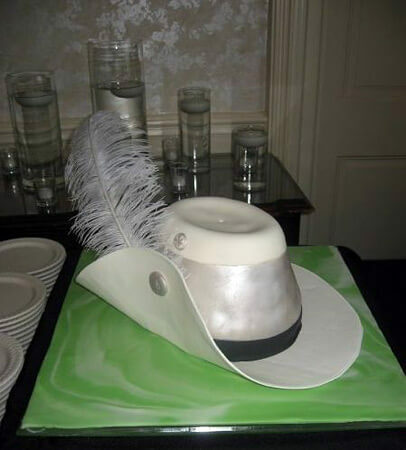 At one point in our reception, a guest actually tried to pick the cake up as if it were the actual hat! In fact, by the time we had a glimpse of the cake, guests had poked many holes in it to see if it was the real thing! Special thanks to Cindy's Let Them Eat Cake from Titusville, Pa., for creating this very authentic likeness of the Cavalier aussie.